a new kind of vulnerability? It’s not been a great weekend. The last few days have got me thinking a whole new take on vulnerability.The vulnerability of feeling useless and powerless to do anything while seeing something horrible occur. Earlier this week our dog was attacked by another dog. It was horrendous for my daughter who was walking him with a friend. We had to rush our dog to the vets, he stayed overnight and is back with us but with 30 stitches in his neck and ear and 4 drains coming out of wounds, with a few more visits at the vets lined up. As we gaze at the injuries, our feelings of uselessness to help or relieve the pain seem to be linked in some way with a sense of vulnerability in ourselves. The fact that I can do nothing itself leaves me feeling very vulnerable for some reason …. and I do not know why! So … in my reflection I am mulling over the wonder of whether there are different kinds of vulnerability. Or … are there a variety of triggers ‘out there’ that cause us to feel vulnerable to what is around us? It’s an interesting question because, with my logical thinking head on, there is no reason for my feelings of vulnerability! I could understand feeling sickened, or angry or wanting revenge …. but feeling vulnerable is quite uncomfortably odd. I am wondering if the feelings of vulnerability come from a mind that likes to ask what if …. what if he had attacked the girls walking the dog, what if he had attacked me, what of we had left 10 minutes later, what if they had opened their front door 2 minutes later …. I guess ‘what if’s’ remind us of a certain fragility of our life journey. We like to live and believe, subconsciously we will be around forever. But maybe a sudden shock reminder of our fragility fuels the feelings of vulnerability. It’s easy to feel safe when you believe you are in control. When something unexpected and horrible happens that we can’t control, it is then when the feelings of vulnerability flood our emotions and sense of thinking. Maybe, of course, my mind is mistaking great sadness, and emotion, and anger with the feelings of vulnerability? I could see that making some sense, although on reflection I’m pretty sure that is not the case. Vulnerable is what I feel and I don’t know why. 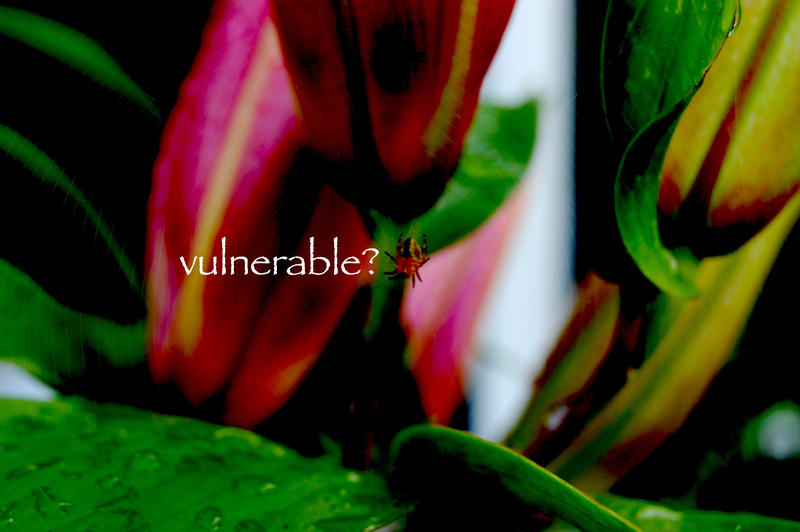 To top all of this, I think being vulnerable is important to our personal growth … but maybe there is an unhelpful sense of vulnerability as well, maybe some types of vulnerability are not helpful …. more reflection needed … so I’m glad I’m giving myself the whole year for this! This entry was posted in faith, family, life by robryan65. Bookmark the permalink. I think there’s a difference between being vulnerable (able to be wounded) and being powerless. It sounds more like you’re suffering from feeling powerless, and that can be incredibly frustrating and anger provoking. But it can also serve to remind us that there’s only so much control that we have over anything, so we better make friends with acceptance, patience and gratitude. I wasn’t intending to throw a bunch of platitudes at you, but it’s what hit me reading your post. Best to you and yours. Love and vulnerability are intwined. I am so sorry about what happened with your dog and am relieved that he will be OK. Not that it’s entirely the same, but some time back we were burgled, just an opportunist,but I remember feeling very vulnerable after that. All the ‘what if’s’ as well, Probably when something that belongs to you is hurt / taken, it does leave you feeling threatened and therefore vulnerable.